We use different devices like mobile phone, Camera etc in our daily life. Devices need data Storage memory which is called SD Card or Memory Card. This multi-useul memory card has different storage capacity. if we need Memory Card, directly we goto the shop and buy different GB's memory card but we dot not ask about Type nad class of memory card. we must know the importance of memory card type and class like memory cards capacity. 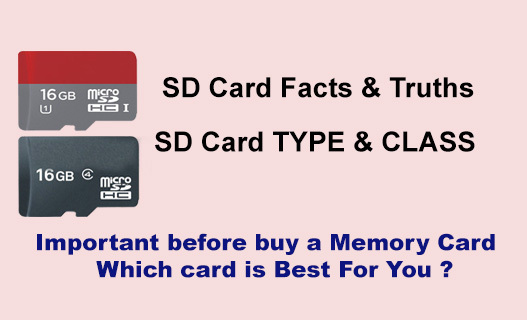 Let's know about the types and class of Memory Card. we must know about types and class of Memory Card not only about its Storage capacity. There are three tyoes of different memroy cards are available in the market. This types of memory card has 128MB to 4GB storage capacity. This types of memory card has 4GB to 32 GB storage capacity. This types of memory card has 64 GB to 2TB storage capacity. The most important thing is that we must know about its class while buying Memory card for your devices. Tha class of memory means speed of data Read and Write. The e speed of transffering data from cards or while transferring data from memory cards is called class. We can buy same GB of memory cards in diffrent price. because Price of memory cards depend on Class. For Exe : if class is 4 of 16 GB memory card it is cheap because data transfor rate too low, it means only Data transfer rate speed is only 4 Mb per secand. Where as class is 10 on same 16 GB memory card it is more expensive and data transfer rate is high. it means transfer rate is 10MB per secand. So if your memory card is high class it has high capacity to data Read and Writes. Another More faster and best Memory class is called UHS1 and UHS 3 class Memory Cards. UHS1 kind of memory Card has a 30MB per secand data Read and Write capacity. UHS3 class memory card is the best memory card you can get more than 30MB per secand data transfer speed in UHS3 class memory cards. If you are going to buy Memory card for General purposes for your mobile phone you have to use 2 class memory cards but if you want to Record HD video 4/6 class memory card best for you. If you planing to to Record Full HD to 4K Resulation Video you have to buy 10 class memory card. if you used this class of memory card you can get high quality video and faster Read and write speed. If you want to record High Quality video up to 4K from DSLR camera or any device it is good to choice UHS1class memory. if your choice is UHS3 class card its more faster and better than UHS1 . So, if you are planing to buy memory card first you must understand about class of memory card its speed depend upon your class of memory card. i hope now you can choose a memory card which is best for you.